This fantastic resourt community is perfect for a MONTH, a YEAR or a Lifetime! Beautiful 2 bedroom/2 bath furnished condo with relaxing views of the nature preserve and river! Light & bright kitchen with corian counters and GE Profile Appliances! Split plan bedrooms! Both bedrooms and the living room open to relaxing balcony to watch the boats pass by on the Intracoastal Waterway or just nature at its best in front of you! You can truly live like you are always on vacation! Enjoy the amenities which include unlimited golfing, 3 professionally maintained clay tennis courts lighted for night play, at pool by the Marina or the pool at the Beach Club on the ocean. Over 4000 feet of elevated walkways across the natural conservation areas and out to the Halifax river. Two Fitness centers and plenty of bike paths. Boat slips in the deep-water marina are available for lease also! Southern water. Great for surfers. Check the "Ponce Project website" for interesting work from a local artist and surfer. Ideal for families with kids, young surfers, and those who are running from the cold winters in the North or those who have retired and want to enjoy peaceful beaches, sports, good food, tranquility, friendly and relaxed people. • Paddle fans with lighting in all bedrooms and living room. * Living and dining-room: condo has been decorated by an interior designer and lots of inputs from the owners who lived in Europe, South and Central America. Lots of decor and art from Italy and other interesting places in the world (Jamaica, Argentina, Morocco, Malta). Mahogany table sits six; TV-DVD-Music center with surrond sound. • 30" Radiant glass cook top, dishwasher, garbage disposal. * High quality utensils, cutlery and appliances. * Cook or have a drink from the kitchen bar and you can enjoy the sunset over the Halifax River. Great view of the Ponce Inlet Lighhouse. * Balcony has one glass and iron table with four chairs. leather chair, bookcase. Enjoy the view from the Frech Window while you read your emails or work or simply read. Door opens to the balcony. In suite bathroom. room is IN the appartment. Hi, I am originally from Argentina, moved to USA in 1985, went to school at Georgetown University in Washington DC, have lived in Italy, Jamaica, Nicaragua and work in many countries in Latin America and the Caribbean. I love to travel, have a wonderful husband and daughter, and we love to spend our summers in "the condo". Enjoy surfing, golfing, tennis, eating out in many of the great restaurants, and of course we have to go to Disney every year. We bought the condo when we were living in Italy. We fell in love with the place, and it was our sense of home. We return every year and we miss it a lot when we are not there. It is wonderful. We decided to buy the blue prints back in 2002 when we were living in Italy. My in-laws had a condo in Daytona Shores and we loved the serenity of the place, its wide and long sandy beach, the people, it is a little bit like going back in time. Still unspoiled by malls or high condominiums and it is very environmentally conscious. the Marine Science Center at the Light House is wonderful and it is a great educational facility as well as the light house museum itself. In addition you can enjoy the Arts and Science Museum in Daytona. 5 minute bicycle ride to the beach. 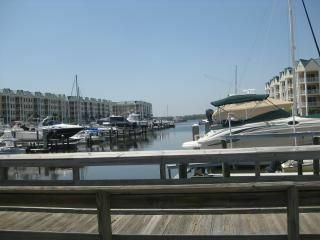 The condo is situated between the Halifax River and the Atlantic Ocean. The Halifax river is beautiful. The condo has a fishing pier. Lots of boating, specially on weekends. Living room sits 6 people comfortably, has TV, cable, with surround sound system, faces the balcony with view of the bird sanctuary and the Ponce Inlet Light House. Fully equipped with pots and pans, silver ware, trays, blenders, coffee makers, etc. with table and chairs. Sits 4-6 people. Beautiful view of the bird sanctuary. At the Links building where the condo association has its main office. Community Features: Offers a unique marina lifestyle in a gated community, with private yacht club & restaurant, heated swimming pools, fishing pier on the Halifax River, and one mile of scenic elevated walkways through wildlife conservation areas. • 104 acres of conservation area with over 6,000 feet of elevated walkways • Lush tropical landscaping design throughout the community • 142-slip deep water marina with state-of-the-art reinforced concrete floating dock system, utilities pedestal with water, power, telephone and cable TV • Nine-hole par three golf course; tennis & fitness pro shop; Private Beach Club including an elevation dune walkover, heated fresh water pool, wading pool, spa, lockers, showers, pool bar, and grill for outdoor dining. Enjoy resort style amenities, boating, swimming, tennis, golf, fishing, biking and dining, and exercise all within the gated community. Walk or bike to World's Most Famous Beach, Ponce Inlet Lighthouse, waterfront restaurants, surrounding marinas, deep sea fishing charters, nature preserve, fishing jetty minutes away, or, Sun Cruz Casino ships sail daily. We just completed a month long stay at this condo with no regrets. The amenities kept us busy. The view from the top floor of the inter coastal waterway is lovely. Watching the boat traffic on the river was interesting. The condo was comfortable, with all the kitchen necessities you would need. We stayed at the condo during Hurricane Matthew. The building sustained no damage; thus it is well built. The beach club was a comfortable walk from the condo as was the private restaurant/pub. Food there was very good and well priced. Water aerobics is available. I did the aerobics with a group of women who were very welcoming and fun. We felt very secure at this property and the entire Harbour Village property. We are looking forward to staying here next year. We had the pleasure of wintering in this beautiful condo, so perfect with all the amenities, and very comfortable, impeccably maintained, and stocked with proper kitchen gear for our extended stay. The view is beautiful and unobstructed looking straight out over the river and when you lean to the right you catch the ocean view also. Beautiful sunsets that hallmark cards are written by. This condo is spacious and airy and perfect with 2 bedrooms and 2 baths. Great find owners are lovely also always on hand if needed. Thanks so much for this wonderful review. Indeed we love Harbour Village and our condo is our refuge from daily life. All the best to you. We rented this condo for the month of May to satisfy my longing to be back at the beach. I hated to leave. This condo is lovely, tastefully decorated, well maintained, and well equipped with everything a renter could possible need. Its pristine location on the fifth floor overlooking the Halifax River afforded privacy, security, and views of the Ponce Inlet lighthouse as well as the boats traversing the Halifax River. Its proximity to the traffic free and, at times, people free pristine beach was more than I could ask for. We were met by Alice who provided us with not only the keys and needed codes but a tour of the area and the amenities in the complex. It was so nice to have someone on site who could help us acclimate ourselves to the area as well as offer recommendations for restaurants and activities. We had one minor issue with one of the toilets, but this was immediately addressed. We enjoyed the pool, the hot tub, the beach club, and the par three, nine hole golf course. The private Marina Club restaurant had the best pizza I have had since leaving New England. We loved many of the casual local restaurants including Inn at the Harbor, The North Turn, Boondocks, and Aunt's Catfish. The Cracked Egg was a great breakfast place, and Pat's Diner on the River, although a little quirky served exceptional French toast. I can not say enough about the condo, the location, the amenities, the management, and the entire experience. I will say that the photos do not do the condo justice. I will also say that we requested that Alice show us some of the current listings in hopes that in the future this complex may be our future retirement home. Harbour Village is a wonderful place! We had an awesome vacation at your condo, everything was close by, restaurants, stores and Entertainment. The unit was very comfortable and very clean and well equipped in the kitchen. Also your responsible person was very nice and always available, we will rent again next year. Thanks again! Thanks so much for your review. It is a pleasure to have tenants like you. Looking forward to having you at home again! This is our second year renting this lovely condo for the month of November. The south facing balcony is ideal for this time of year; sheltered from ocean winds with beautiful views of conservation area, intracoastal waterway and lighthouse. The unit is spacious, beautifully furnished and well equipped. We enjoy hosting dinner parties for friends who also vacation in the area. The property has exceptional amenities (golf course, heated pools, club house with bar and restaurant, fitness centers and beach club)It is also kept very clean and beautifully landscaped by a very friendly staff. The owner is excellent to deal with and her property manager is a local resident who is very attentive. Local seafood restaurants are excellent and there are many golf courses within an easy drive. We discovered and especially like The Preserve at Turnbull Bay. As Canadians we are a little puzzled by the food and shopping extravaganza of this week (Thanksgiving) but are grateful to have the opportunity to share it with our new American friends. We are already making plans to return next year! Very glad with this review, I think is very objective and factual. I can't emphasize enough how lovely this place is, not only the condo but the surroundings. I wish I could be there all year long! Thanks so much for the review. Imagine stepping out of your front door and onto your yacht. You are only minutes to the inlet and the Atlantic Ocean with one of the most gorgeous white sandy beaches anywhere. My favorite spots to eat include Down The Hatch, The Light House restaurant a couple of miles south down by the lighthouse, and Boondocks (outdoor dining on the river) and Aunt Catfish on the River. Excellent Italian food at Alfredo's Ristorante on Clyde Morris and across the street: Ritters' great frozen custer. At the Art Deco district of Daytona beach try the Avocado Kitchen for organic healthy breakfast and lunch. in New Smyrna Beach (you can take the ferry or drive for 20 minutes) try Garlic, excellent Italian food and great ambiance.